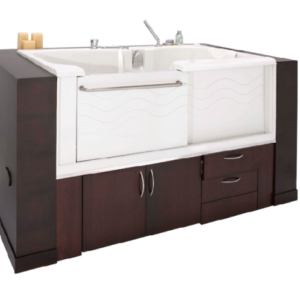 The Petite Massage 24 air and water jet hydrotherapy walk in tub comes fully loaded with numerous features. Not only does it have an incredible hydro massage system, but it also comes with multiple light chromatherapy mood lighting, thermostatic control valve, water foot massage, air flow control jetting, internal safety grab bar and a 360 degree swivel tray. There’s a good chance you could look forward to going home and taking a bath more often with this tub. When designing a bathroom for aging in place, a walk in tub or shower should be something to consider. Having an elderly bathtub or walk in shower makes sense for a lot of people looking for ways to stay out of long term care. Being able to remain independent and bathe without the fear of falling is important. None of us want to be scared to take bath or shower. But the reality of it is, many people do have fears of falling in the bathtub or shower. Rightfully so, every year people have serious accidents in the bathtub. You may already be researching aging in place bathroom design and learning about the many options available to you. Having wall mounted safety grab bars is another precaution that can help design a great aging in place bathroom. Many people install ADA compliant grab bars by the toilet, bathtub, shower, entrances and any place where extra stability is desired. All of Aging Safely’s step in baths have showers as well. They have a removable hand held shower wand that can make it easier to shower while sitting down. However they can be wall mounted as well and function similarly to a regular shower. The Ella’s Petite model has a 5 piece chrome roman faucet set with handheld shower. We want to help you find the best step in bathtubs with shower options available! Bathroom safety for the elderly can look great and feel even better! Sit in bathtubs are the right option for many and can provide a sense of security when bathing.